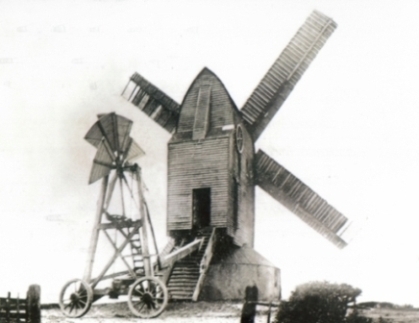 A windmill was first recorded on the site on top of Argos Hill in 1656, when Nicholas Puxte of Garden House held "Ye windmill field att Argatts Hill". The current mill was built around 1835 for the Westons, in whose family it remained for over seventy-five years. The mill is now owned by Wealden District Council. 1955-1956 Original restoration work by W. Sands of Heathfield. The sails were renewed, repairs were made to the body framing and the tailpole was replaced. 1963 Mill struck by lightening. One sweep and wall of roundhouse damaged. 1999 Sails removed. Friends of Argos Hill Windmill set up. June 2005 Meeting held between The Friends of Argos Hill Windmill, Wealden Council, and Mayfield and Five Ashes Parish Council to discuss the future of the mill. September 2006 English Heritage produced an internal memorandum on the windmill. January 2008 Wealden District Council threatened to dismantle the windmill and put it into storage. 2008 Negotiations took place with Wealden District Council to form a trust to ensure the mill's survival. 2010 Argos Hill Windmill website launched. Argos Hill Windmill Trust formed. 2011 Wealden District Council lease the mill to the Argos Hill Windmill Trust. Fundraising campaign launched. 2012 Steel frame installed to support the mill body. 2013 Planning and fundraising for the restoration carried out. The mill was featured on BBC1's "Restoring England's Heritage" TV programme. 2014 Major grants towards the restoration were awarded by the Heritage Lottery Fund, Architectural Heritage Fund, Charles Hayward Foundation and The Rotherfield Trust. Restoration work started on site. 2015 Structural repairs completed, weatherboarding installed, sweeps manufactured, shutters painted. 2016 Phases 1 and 2 of the restoration completed - steps, tailpole and sweeps installed. Grand opening of the mill held. Phases 3 and 4 of the restoration project launched. The sweeps were turned by wind for the first time in over 80 years. Firstly, Miss Catherine Pullein in her book, Rotherfield (revised edition published 1928) says that a "quit rental" of 1656 proves that there had been, or still was then, a mill on Argos Hill. Earlier Subsidy Rolls (which were Manorial Records) dated 1612 and 1624 identify John Weston as holding the land referred to in the text with Nicholas Puxte senior. The Weston and Puxte families were known miller families. Later Nicholas Puxte junior of the Garden House in Rotherfield held "Ye Windmill Field at Argatts Hill" John Moone lived at the Mill House in 1692, and his son John Moone after him from 1717. It is very likely that all this refers to a windmill on, or very close to, the site of the windmill today within the grounds of the Mill House. Secondly, a mill near Argots (Argos) Hill in Mayfield is referred to in 1724, when it was worked by a miller called John Weston. At that time the mill and 32 acres of land were in the tenure of Francis Hammond. Thirdly, Richard Budgen's map of Sussex dated 1724 clearly marks a windmill at Argos Hill. Finally, the nature of the land, sitting at 600ft above sea level and open in all directions, suggests that it is highly probable, given the importance of wind power for several hundred years, that mills have occupied this site.